Offering Aarthi means calling out to God with intense yearning. If a human being calls out to a deity through the medium of the Aarthi then he is granted either a vision of God in the form of light or of the deities’ form. The hymns in an Aarthi which are in praise of the deities, also entail an earnest prayer made unto God to win His grace. 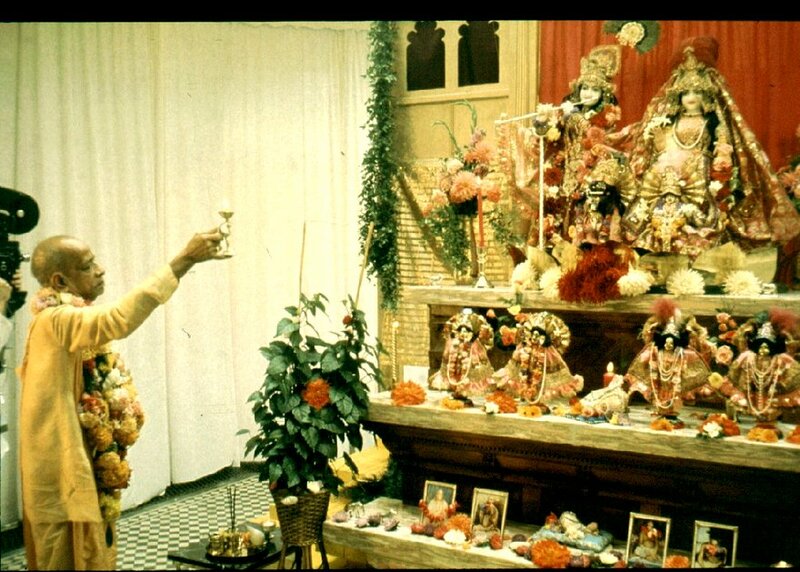 The deities and God who bestows grace, are pleased with the praises and worship of the one who offers Aarthi. Towards the end of every ritualistic worship (pooja or bhajan) of the Lord or to welcome an honored guest or saint, we perform the Aarathi. This is always accompanied by the ringing of the bell and sometimes by singing, playing of musical instruments and clapping. It is one of the sixteen steps (shodasha upachaara) of the pooja ritual. It is referred to as the lighted lamp in the right hand, which we wave in a clockwise circling movement to light the entire form of the Lord. Each part is revealed individually and also the entire form of the Lord. As thelight is waved we either do mental or loud chanting of prayers or simply behold the beautiful form of the Lord, illumined by the lamp. At the end of the aarthi we place our hands over the flame and then gently touch our eyes and the top of the head. 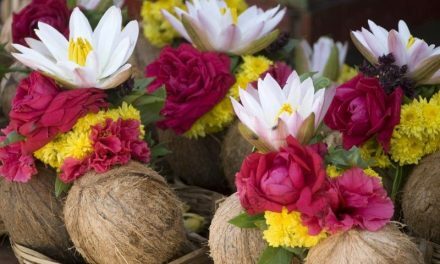 Having worshipped the Lord of love – performing abhisheka, decorating the image and offering fruits and delicacies, we see the beauty of the Lord in all His glory. Our minds are focused on each limb of the Lord as the lamp lights it up. It is akin to silent open-eyed meditation on His beauty. The singing, clapping, ringing of the bell etc.denote the joy and auspiciousness, which accompanies the vision of the Lord. Aarthi is often performed with camphor. This holds a telling spiritual significance. Camphor when lit, burns itself out completely without leaving a trace of it. It represents our inherent tendencies (vaasanas). When lit by the fire of knowledge which illumines the Lord (Truth), our vaasanas thereafter burn themselves out completely, not leaving a trace of ego which creates in us a sense of individuality that keeps us separate from the Lord. Also while camphor burns to reveal the glory of Lord, it emits a pleasant perfume even while it sacrifices itself. In our spiritual progress, even as we serve the guru and society, we should willingly sacrifice ourselves and all we have, to spread the “perfume” of love to all. We often wait a long while to see the illumined Lord but when the aarthi is actually performed, our eyes close automatically as if to look within. This is to signify that each of us is a temple of the Lord. Just as the priest reveals the form of the Lord clearly with the aarthi flame, so too the guru reveals to us the divinity within each of us with the help of the “flame” of knowledge (or the light of spiritual knowledge). At the end of the aarthi, we place our hands over the flame and then touch our eyes and the top of the head. It means – may the light that illuminated the Lord light up my vision; may my vision be divine and my thoughts noble and beautiful. 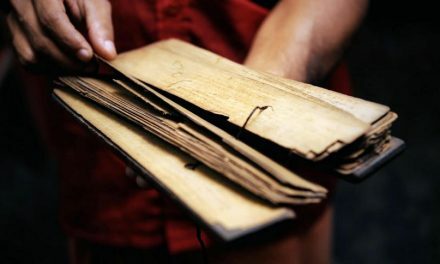 The philosophical meaning of aarthi extends further. The sun, moon, stars, lightning and fire are the natural sources of light. The Lord is the source of this wonderous phenomenon of the universe. It is due to Him alone that all else exist and shine. As we light up the Lord with the flame of the aarthi, we turn our attention to the very source of all light, which symbolizes knowledge and life. Nor the moon, stars and lightning. And by His light alone are we all illumined. Why is Arti Performed Twice a Day? 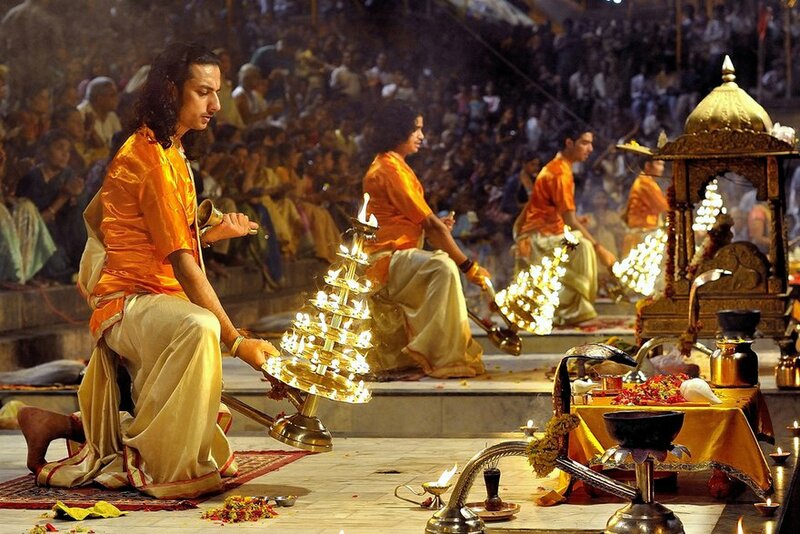 Arti is meant to be performed at sunrise and sunset. At sunrise the raja-tama predominant atmosphere present throughout the night is destroyed and the absolute fire element frequencies of Deities arrive in the universe. Hence, Arti is to be offered at sunrise to welcome them. The ‘tarak Chaitanya’ (saviour form of Chaitanya) transmitted during the arrival of the frequencies of Deities at sunrise is to be welcomed by the worshipper through the medium of the Arti, whereas at sunset, the Arti is performed to destroy the raja-tama frequencies and to invoke the Deities’ ‘marak Chaitanya’ (destroyer form of Chaitanya). That is why Arti should be performed twice – at sunrise and at sunset. 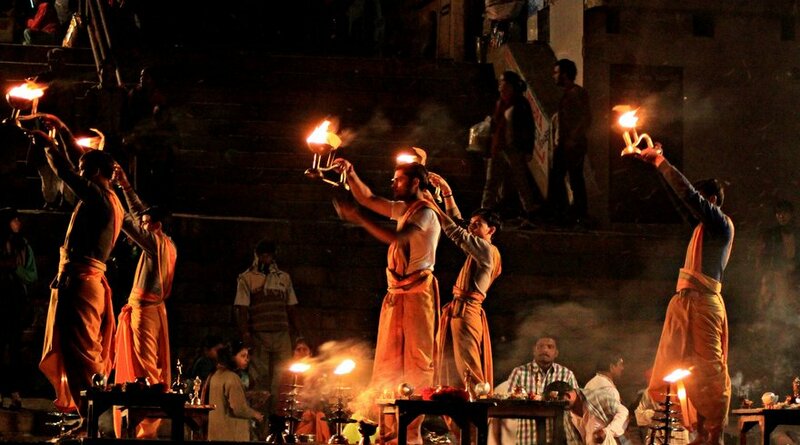 What is the Science in Performing Arti at Sunset? At sunset the proportion of the absolute fire element in the Sun’s rays starts reducing and the predominance of the raja-tama particles in the atmosphere increases. The generation of raja-tama frequencies also increases. Taking advantage of this situation, the negative energies increase their movement in the environ-ment. To prevent distress from such a predominately raja-tama environment, it is essential to evoke the Deities through the frequencies of sound emitted through the Arti and bring these frequencies into the orbit of the universe. As a result the proportion of the frequencies of Deities enriched within the environment increases and the proportion of distressing vibrations decreases. This creates protective armour around the devotee’s body. The Arti should be sung with the bhav that ‘God Himself is standing in front and I am calling out to Him earnestly’. The more the bhav one has while singing the Arti for God, the more enriched with bhav and sattva predominant the Arti will become. Such an Arti will reach the Lord faster. Individuals singing an Arti in this manner benefit as follows: The greater the collective bhav of the group singing the Arti, greater is the extent and period of preservation of the frequencies of Chaitanya (Divine consciousness) of Deities in the environment. This leads to a reduction in the distress from negative energies and gaining the benefit of Chaitanya. Every embodied soul should make an effort to perform the Arti with bhav. Also as a covering is formed on the ground by these sattva predominant vibrations (which stops the transmission of distressing frequencies from the Negative subtle regions), the worshipper’s embodied soul benefits most from the Chaitanya. Thus during the Arti the worshipper’s gross and subtle bodies get purified and results in his faster spiritual evolution. On waving the Arti platter in front of a Deity Why should an Aarthi platter be Waved in a full Circle in front of the Deity? When offering Arti, using a lamp with five wicks (also called pancharti), the platter containing this lit lamp should be waved in a full circle in front of the Deity. This results in a speedy circular movement of sattva frequencies emitted by the flame of the lamp. These sattva frequencies then get converted gradually into raja frequencies. They appear like ripples in the water. A suraksha kavach (protective armour) of these frequencies is formed around the embodied soul of the worshipper offering the Arti and is known as a ‘tarang kavach’ (lit. ‘ripple armour’). 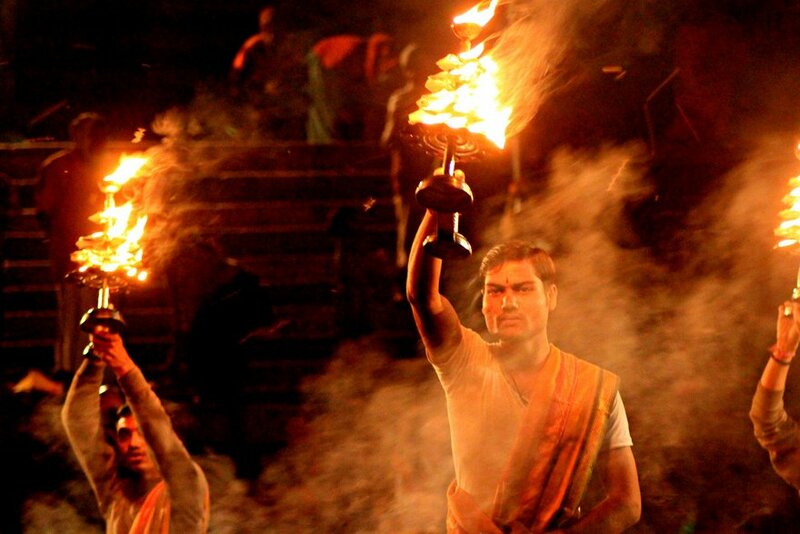 The more the spiritual emotion of the worshipper offering the Arti, longer this armour lasts. As his sattva component is enhanced, he is able to absorb more Divine frequencies from the Universe. 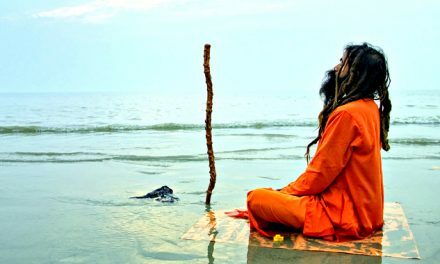 This increases his spiritual emotion and he perceives the reflection of his soul in the form of a blue spot of light (also known as Atmabindu) in front of him and a ripple of raja frequencies emanating from this Atmabindu. Why should the Aarthi platter be Waved in a Clockwise Direction in Front of the Deity? As the earth moves in the clockwise direction, the frequencies in the environment do not offer any resistance to the movement of the lit lamp. 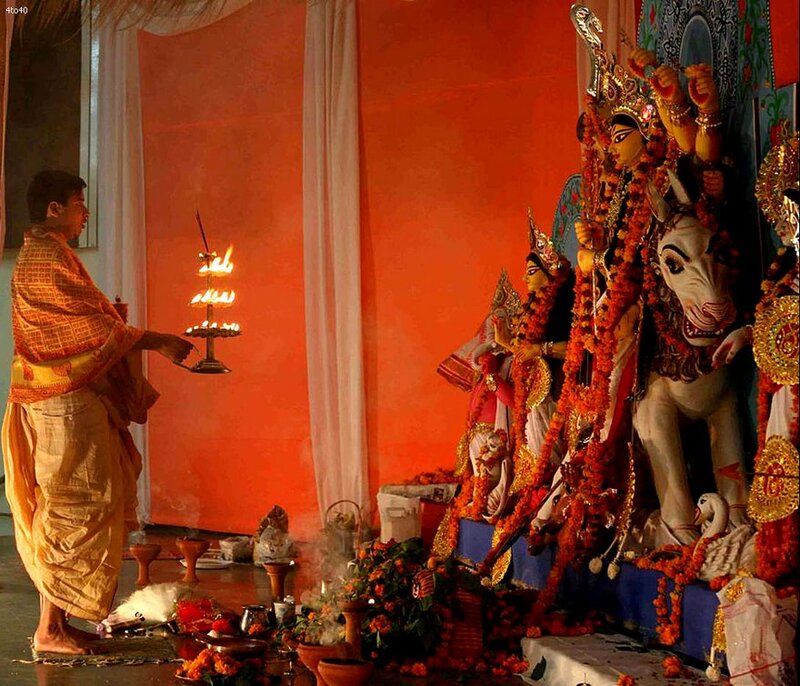 Why should the Arti platter not be waved above the head of the Deity? The Aarthi platter should not be waved above the head of the Deity, but should be moved from the Anahata to the Agya Chakra of the Deity. Due to the influence of the raja frequencies emanating from the Arti, friction develops with the sattva particles in the serene frequencies related to the unmanifest Divine principle (emitted from the head of the Deity). As a result, they can disintegrate before being transmitted. That is why the Arti platter should not be waved above the head of the Deity. Thus, the high-speed frequencies emitted from the Adnya chakra and which are related to the attributes of the Deity get complemented by the raja frequencies emanating from the lamp of the Arti. This enables them to be transmitted effectively in the environment forming a protective armour around the worshippers and destroying the raja-tama in the environment. The Arti platter should not be waved above the head of the Deity, but should be moved from the to the of the Deity. Due to the influence of the frequencies emanating from the , friction develops with the particles in the serene frequencies related to the unmanifest Divine principle (emitted from the head of the Deity). As a result, they can disintegrate before being transmitted. That is why the Arti platter should not be waved above the head of the Deity. Thus, the high-speed frequencies emitted from the and which are related to the attributes of the Deity get complemented by the raja frequencies emanating from the lamp of the . This enables them to be transmitted effectively in the environment forming a protective armour around the worshippers and destroying the raja-tama in the environment. Thank you for this wonderful & beautiful site. Having learned so much I tell others to pursue this site. Thank you very informative .